This is quick and dirty, just a stencil and some markers. More art can be added to it as time permits. I decided against the moose horn because it’s too unwieldy to carry on transit or on a bike. 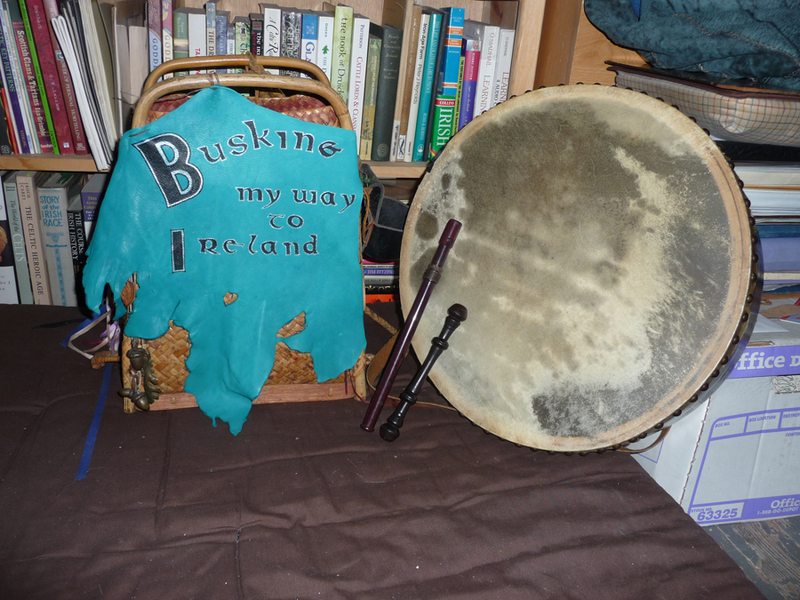 The pack and the drum are doable, if a bit of a pain. Having a deep basket to throw tips into should keep the occasional kid from trying for the money, as one did my first week out. Also, people have no idea what I’m about. How can they, if I don’t tell them, quickly and clearly? And what do you think? Does this work? If not, why not? I’ll be at the Freight open mic tonight. For $3 you can see the whole show via Concert Window, and for $8.99 a month, you can see unlimited concerts at various folk venues. I watched De Temps Antan, also at the Freight and Salvage, this way last week, and the sound and image quality was pretty good. I’m planning on watching the Freight Roots Revue this way on the 30th, and they’re going to have Holdstock and Macleod, and Mary Black in the near future. I’ve been thinking on the nature of dreams and what I’m tackling a lot over the past week. It has been as if there was a wall of impossibility holding me back. Standing out at the Swap, singing into a concrete wall, seemingly heard by no one, I wonder just what I think I’m playing at. But then the people I swap with thank me for the music, or someone sits down at the benches and listens for a while, or I just get the bounce of sound off that concrete wall during a lull in traffic and I know that very few things happen immediately. I need to do the work and the rest will come in its own time. My mother put herself through college back in the fifties and I remember what she used to tell me. It was hard for her, much harder than it has been for me. She came out of German Village in Columbus, Ohio, and she was the first in her family to go to college. She worked and went to school, paying her student loans off as she went because in those days they weren’t deferred. She told me she used to fall asleep on the bus, after working all night and going to school all day, and then she laughed. She said she decided that she had a choice. She could work and go to school, or she could just work. If she can do it, so can I. Because I will be working anyway, and every time there’s a chunk of money I could spend on a plane ticket, it either has to go into the house, or to pay something off, or the savings account is so desperately low that I just can’t look myself in the mirror if I spend it on what is essentially a treat for myself. But the money in the basket is mine. It will be spent for no other purpose. I will earn my way across the sea if it’s the last thing I do. I’ll do it five dollars at a time, and I know that if I just keep on going, keep on learning more songs and getting better at what I do, the way will open. So what’s your dream? What would you do if you could do whatever you wanted? Are you on your way, or still dreaming? What would it take to make it happen for you?